Amid the U.S.-China trade war, China is importing more soy from Brazil while the United States exports more soy to the European Union and other outlets, which may increase deforestation pressures in Brazil. This shift represents a major risk to efforts to eliminate deforestation on the soy supply chain and is likely to reduce the market impact of consumer goods companies that are retailing zero-deforestation products. China slapped a 25 percent tariff on U.S. soybean producers, implemented on July 6, 2018, in retaliation for the Trump administration starting a trade war against Beijing, impacting global trade flows. The trade dispute began in January 2018, and has escalated throughout the year. In 2Q 2018, Brazil’s soybean exports increased 50 percent compared to the same period in 2017, according to Bloomberg Intelligence, with 58 percent of Brazil’s shipments heading to China. China imports 60 percent of globally traded soy. Last year, China imported one-third of the U.S. soybean crop, valued at USD 14 billion, which it uses for cooking oil and feeding livestock. However, U.S. traders have already canceled 0.165 million metric tons for delivery to China for the 2018-19 marketing year that begins September 1, 2018. In fact, for the current 2017-18 marketing year, canceled sales are higher than 5 million metric tons. As of July 5, 2018, U.S. exports to China have totaled just 28.1 million metric tons for this year, down from 36.1 metric tons a year ago. Lower soy prices – the August contract on the CME is down 15.5 percent since April – and China’s tariffs have hurt U.S. producers. While traders are able to profit from market volatility during the trade war, at least one trader has also taken difficult hits because of lower prices. For instance, Bunge Ltd lost USD 125 million in Q2 2017 as a result of speculating on higher soybean prices on the CME. To make up for changing market conditions, U.S. producers are looking to expand into EU, Middle East, and SE Asia markets. Against this backdrop, the U.S. Department of Agriculture (USDA) expects cumulative U.S. soybeans exports to fall next year. The agency revised its U.S. export outlook downward by 11 percent. As China’s demand for soy remains high to help feed its growing population, it is looking to deepen its ties with Brazil. China is Brazil’s top trade partner. Since the beginning of this decade, China has tightened its relationship with Brazil to shore up its supply of soy. In 2011, China inked a $7 billion agreement with Brazil for 6 million metric tons of soy per year. Since then, China has continued to spend a large amount of money in Brazil to support infrastructure for energy and agricultural commodities. Last year, it invested almost USD 21 billion to help secure supplies. Brazil’s soybean production for 2018-19 is set to reach a record of 120.5 million metric tons, up 1 percent from the previous year. As a result, the harvested area is also expected to reach a record, hitting 37.5 million hectares (mha), up 7 percent from last year. Forecasters see the soybean area expanding as it has for the past decade, with 2018/19 having highest annual increase in 5 years. 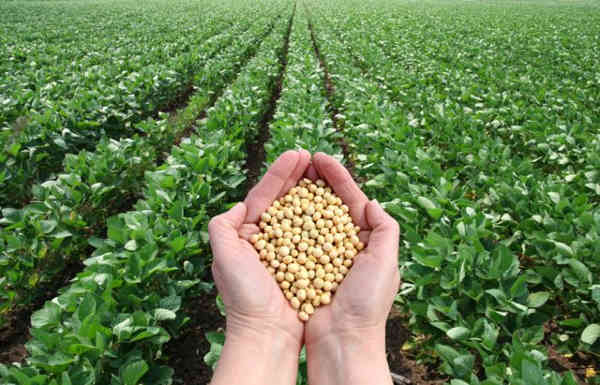 Brazilian producers are expected to plant more soybeans to capitalize on the trade advantage over the United States in response to China’s imposition of retaliatory duties. Beijing’s close relationship with Brazil will likely continue, given that China imports 90 percent of its soybeans. China has provided subsidies to its farmers to stimulate domestic production, but growers in China do not expect that to meet demand growth. At the same time, increased Chinese demand may come at the expense of soy heading to the EU. Forecasters at the USDA have pegged global soybean production for 2018-19 at 359 million metric tons. That is 4 million metric tons higher than last month’s projection. Increased output in Argentina, Brazil, China, and United States is set to more than offset declines in Canada. Specifically, Brazilian soybean exports are forecast to rise on higher production, reaching 75 million metric tons. As China invests in supply outside its borders, Brazil and others plan to expand acreage. As such, more Brazilian soy exported to China does not automatically mean more land is needed. Furthermore, more land needed for soy does not guarantee more deforestation, particularly since there is non-forested land available where soy output could expand. In the Cerrado alone, there is some 30 million ha of highly suitable non-forested land available. However, China’s increased imports of Brazil’s soy comes as the country’s government appears to be loosening commitments to reducing deforestation and mitigating climate change. Ten Brazilian scientists wrote a letter to the government, warning that policies are not sufficient to tackle the problem of higher greenhouse gases stemming from deforestation. The letter, published in this month’s Nature Climate Change, stated that the country is unlikely to meet its commitments agreed in Paris accords in 2015 of cutting GHG by 37 percent by 2025, compared to 2005 levels. Reaching these commitments may remain difficult if it continues to increase its soy output.